Teaching an online course that 49,000 students have signed up for presents an unprecedented challenge when it comes to an important aspect of instruction: knowing your audience. I could see from my course “dashboard” in Coursera that the students hailed from 190 countries, with 6 percent from India, 31 percent from the United States, and so on, but these numbers only took me so far. I wondered which places had lots of students earning a passing grade? Which places had students who were really engaged with the course? Since I’m a cartographer, it made sense to make some maps. Relatively little has been done so far with mapping student engagement in MOOCs, so I worked with colleagues in the past year on a research project supported by the Center for Online Innovation in Learning at Pennsylvania State University. Using the Internet addresses logged by more than 49,000 students in my MOOC called “Maps and the Geospatial Revolution,” my graduate assistant, Sterling Quinn, geocoded student locations and tied this information to survey responses and course interactions that Coursera tracks for every student. Using this data set,Carolyn Fish, a graduate student, then created a series of maps to help us explore geographic patterns in MOOC participation. We began by looking beyond just the number of students from each country, using a technique called hexbin mapping to show places that had at least 10 students, which helps us focus on areas with significant enrollments. Our map of course enrollments revealed some interesting patterns. When this class was taught, in 2013, Coursera wasn’t widely indexed on Chinese search engines, so China stands out for its low participation. In Europe, you can see that France was very low compared with its neighbors — no doubt in part because the course was taught in English. Some spots in Spain and Greece were very high, which could be explained by economic conditions that lead lots of young adults to seek alternative means for education. 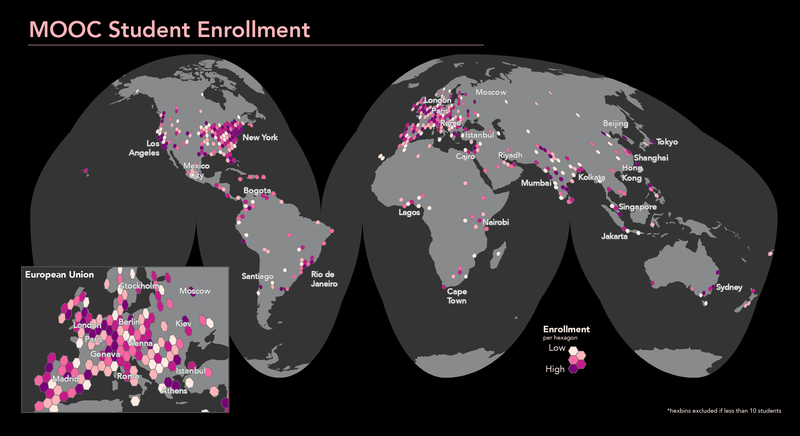 Most of the less-developed world is left out of this map once you focus on places contributing more than 10 students, so the class starts to look a whole lot less global than the map of individual enrollments might suggest. One thing that shocked me was that the Coursera dashboard told me that my course enrolled 70 percent males and 30 percent females. The Coursera average is a 60/40 split, so for some reason my class on cartographic design was unusually imbalanced when it comes to participation by women. I had a feeling that the gender balance would be better understood if we viewed it on a map, and I was right. This map shows the number of enrolled women per 100 enrolled men. There were very few places where there were more women than men, but there were some examples in Eastern Europe, Britain, East Asia, and the United States. Virtually all of the places one might describe as developing countries tended to have far more male students than females. Once again, my MOOC turned out to be less global than it may have seemed at first. When you teach a MOOC, you develop a general sense of which people are participating in the forums, and, thanks to the frantic emails you receive about course deadlines, you can glean a bit more about who is desperate to earn a passing grade. But until we dove into mapping student engagement, we had no idea if it varied around the world. To map engagement, we developed an index that combines forum activity, page views, and lecture views. The resulting map shows that there are some places where engagement was low, such as in South Asia, places like Europe where it was decidedly mixed, and places where engagement tended to be high, such as the United States. The cliché boogeyman of MOOCs is the constant reminder by some critics that a large proportion of MOOC students don’t pass the class. It’s well known, however, that there are wildly different motivations associated with student participation in MOOCs. Some people are there to earn a passing grade, but many are simply hoping to learn something new, and others are just checking out a course at a superficial level. And in most MOOCs (mine included), you can earn a passing grade without being engaged in the course through activities like participating in forums. So we decided to create a map showing both of these variables. As it turns out, there’s a lot of global diversity when we start to look at the data this way. The map shows places in South Asia where engagement was low but people earned passing grades, which signals a different type of motivation for taking the course in that part of the world compared with other locales. We also see places in the United States and Europe where people were engaging with the course and not earning a passing grade — so these would be the folks who were interested in the topic but probably didn’t care about earning the credential at the end. One thing is for sure, student motivations were not distributed evenly around the planet, or even within countries. These examples show that the geography of MOOC students goes far beyond basic reporting that X percent of students came from country Y. When we drill down to explore things like gender balance and engagement, we start to see major differences around the world. What we need now are ways to incorporate this type of analysis into practice while teaching a course, so that we can make smart interventions to encourage participation and improve outcomes. One thing is for sure, student motivations were not distributed evenly around the planet, or even within countries. I love teaching in the MOOC realm — it has advantages and possibilities that just aren’t there in other forms of teaching — but what we’ve seen in this work helps us understand that we’ve got a long way to go yet in terms of making a MOOC work for everyone around the world.